And the Vandals’ new quarterback is? Since four-year-starter and second-leading all-time passer Matt Linehan was lost for his final three games last year with a hand injury, Idaho has ventured down several paths in search of his successor. So far, none has been a well-lit highway to the future. Junior Mason Petrino and sophomore Colton Richardson each started games at the end of last season. After Petrino reinjured a shoulder, Richardson gave up a redshirt to finish the year for the Vandals. He got to start and win Idaho’s final game in the Football Bowl Subdivision against Georgia State. The two split most of the first-team reps in spring ball, although Richardson missed time with an ankle injury. He has the bigger arm, but Petrino showed he can also move the offense. Neither won the job outright, and coach Paul Petrino said both could play this year, especially early in the season. Their performance in preseason camp might determine if this is still Idaho’s default position when the Vandals kick it off in the opener against Fresno State. Is there anything Kaden Elliss can’t do? Going into his senior season with 228 career tackles, 10 sacks and five interceptions as a second-team All-Sun Belt Conference linebacker, plus seven pass receptions for 156 yards and two touchdowns, Elliss has been named to the Paul Hornung Award watch list for college football’s most versatile player. Coach Petrino says Elliss has an uncanny ability to absorb football principles. Draw it up for him once on a board, walk through it once and he’s good to go, Petrino said. This has allowed the Vandals to play him as an outside linebacker, defensive end, tight end, split end, slot receiver and running back. Plus he’s a special team’s stalwart. What do the coaches have in store for him in the preseason? Are the linebackers still dominant? First-team All-Sun Belt selection Tony Lashley is concluding his college career as a graduate transfer at Boise State. Elliss has seen his role on offense expand dramatically, and the Vandals are getting used to a new inside linebackers coach in Adam Breske this fall. 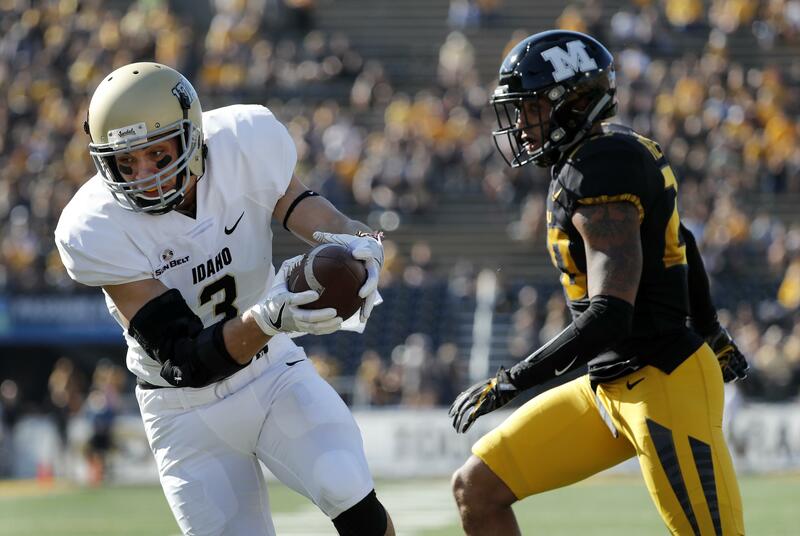 Can the Vandals’ linebackers remain the defensive force they were last year? Well, maybe. Sun Belt Conference honorable mention Ed Hall, with his team-leading three interceptions, provides senior stability. Playing time behind Idaho’s elite starters was at a premium last season, but sophomore Christian Elliss and junior Ty Graham made the most of opportunities. Junior Aaron Puegot plenty of work in spring ball. Has the offensive line improved? Its specific gravity, at any rate, has increased. Idaho went out and got a pair of full-sized human beings in Laney College JC transfers Bruce Burns (6-foot-3, 330 pounds) and Brian Robinson (6-4, 339) to add heft to a unit that was occasionally pushed around last year. They’ll team with 6-4, 300-pound junior Noah Johnson. He spent last spring rehabbing an injury, but as a sophomore he was an All-Sun Belt Conference second-team guard. Other returners in the offensive line rotation like Carlos Collado, Irving Schuster and Conner Vrba have a chance in the preseason to show they are a year older and a year stronger. Who will be the breakout players this fall? Four touchdown catches in a spring scrimmage – two each from Petrino and Richardson – suggested redshirt freshman D.J. Lee might have a future in this football business. Freshman defensive back Zach Borisch went through spring ball with the Vandals as a grayshirt and showed he was up to the challenge of playing in the secondary. After sophomore Dylan Thigpen’s stellar spring game was cut short by a knee injury, redshirt freshman Roshaun Johnson took over with 124 yards rushing and three touchdowns. In an earlier scrimmage, the 240-pound Johnson hurdled a cornerback. Coming into a new season, you have to believe he’s ready to fly. Published: Aug. 1, 2018, 7:09 p.m.